Tonight I was going to put together some swatches of one of the two glitter polish swatches I owe you and their creators, but time slipped away more quickly than anticipated. Those are coming soon though, and trust me, you'll be excited! Halloween and fall colored glitters...hell yes! 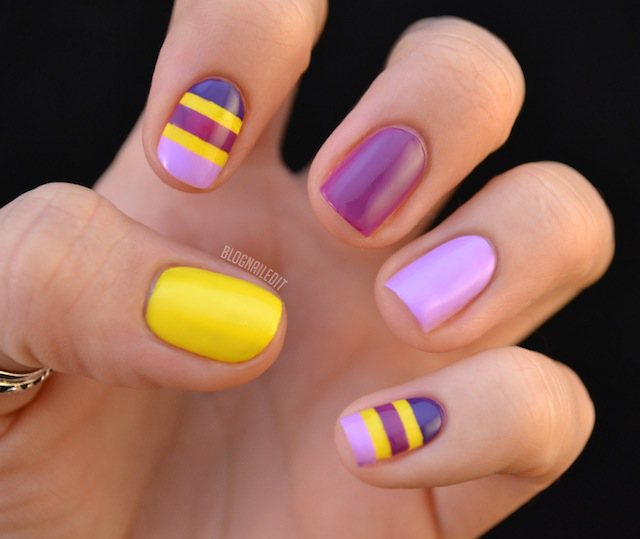 In the meantime, here's a really fun manicure that everyone can do. It's so easy and so striking. I love this. Ingenious in its simplicity! To begin, I painted my pinkie, index finger and thumb with Happy Go Lucky (China Glaze). I painted my ring finger with Lavendairy (Lime Crime) and my middle finger with Keiko (Zoya). Then, I added some thicker striping tape over the yellow on the pinkies and index fingers in two evenly spaced lines. Then, it was just a matter of filling in the empty spaces with Lavendairy, Keiko, and Grape Pop (China Glaze). How fun and easy is this? Try it yourself with some contrasting colors on the color wheel. Orange and blue, red and green. Or mix it up entirely! i love thoses colors!! so nice conbi! Wow, I love this!! Such great colors, and I love the two striped nails! Love the design and the colors choosen! Lovely color combination! So pretty!